Richard Ross AES, composer, location production sound mixer, audio post production engineer, sound designer, and flautist, holds a Masters Degree in Music Composition from the University of Oregon at Eugene with an audio engineering background. 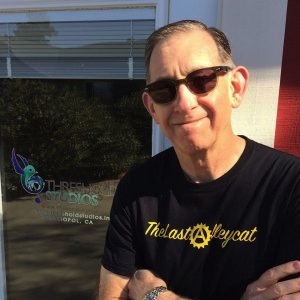 Richard has done production sound, audio post production, and sound design for more than 60 film projects / commercials and engineered many audio recordings. In addition to being a performing musician at the Oregon Shakespearian Festival at Ashland, he also composed music for the Black Swan production of Medea by Euripides. “I Sit and Look Out” was premiered by the Sonoma County Chorus in 1988, and “Natures Songs” in San Francisco at St. Agnes Cathedral by California Choral Artist in 1994. “Laughing Moon” (New Age/Jazz) CD was released in 2017. Richard was a recipient of the Outstanding New Composition award for A Call for New Music from Fresno State University Music Department and a Merit Award winner of the Second Annual Juried Competition for Original New Music Compositions from Sebastopol Center for the Arts in 2003. “Crystalline Dream – “Threshold” (New Age/Classical) CD was released in 2006. Read Zone Music Reporter Review. “Crystalline Dream – “Journeyman” (New Age/Classical) CD was released in 2010. “Crystalline Dream – Alchemy” released in 2016 was nominated for Best New Age CD 2016 by OWMR Radio Network and Best Electronic CD 2016 by ZMR Muisc Awards. "Entropy by RIchard Ross (EDM / IDM) CD was released in 2019. Richard is a publisher / writer member of ASCAP, The American Composers Forum, and Fellow of the Audio Engineering Society – AES. Offering reasonable rates and professional results in a relaxed environment.